"For those who didn't see it on Facebook"
Congratulations on your Achievement! Good Shooting! 2600 right on the nose! Well done! Yeah I don't Facebook either. Congratulations rreid. Great job Ralph, hope to see you Saturday afternoon at Osage. Recognition of Precision Shooting at the NRA is improving. 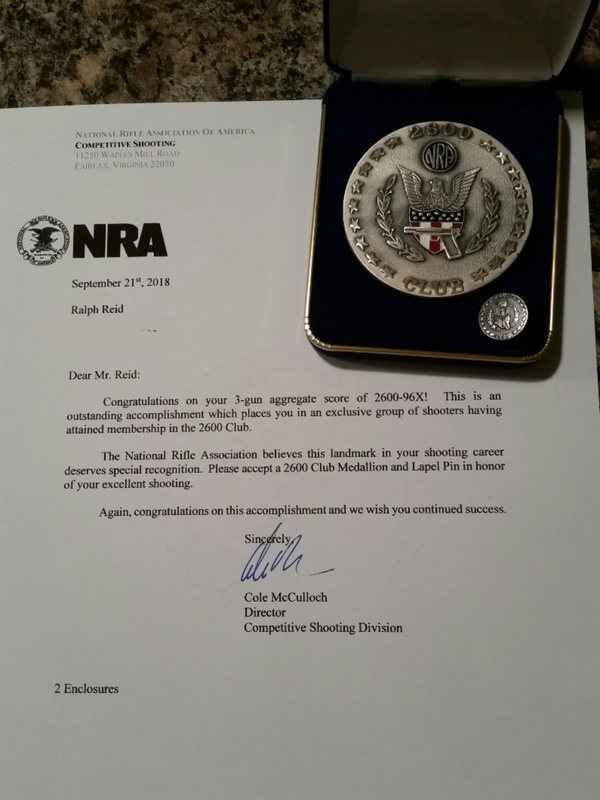 When I shot my 2600, I had to write to the NRA requesting my name be added to the list. I did receive the large medallion; but, no lapel pin. I did not receive a letter of congratulations. Very pleased that the new members are getting better recognition of their achievements. email competitions department for your letter and pin. And thanks for the post as I also do not Facebook.